This two-month training plan is designed to help you crush all 100 miles in a century ride. 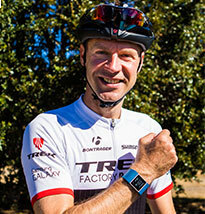 Jens Voigt is a former professional cyclist known for his aggressive riding style and fun personality. His storied career includes two Tour de France stage victories, winning the Critérium International a record-tying five times, and breaking the UCI hour record by 1.410 kilometers, covering 51.110 kilometers in 60 minutes. Learn more about Jens here.